I am thrilled to report that late yesterday a three judge panel on the 7th Circuit Court of Appeals unanimously ruled in our favor in WRTL v. Barland II. This free speech victory declared two onerous GAB rules and portions of state law unconstitutional. While we don’t yet know the full impact of this decision on our operations, the most important result is that the state organization and our chapters will be able to conduct issue advocacy, including distribution of candidate comparison pieces, without being subject to extensive regulations. This challenge began in 2010 when GAB first promulgated its rules. For a time, the State Supreme Court enjoined the rules but then lifted its injunction in March of 2012. At that time, we resumed our challenge in federal court, lost at the district court level and have now succeeded on appeal. I read the 88 page decision last night and was both proud and humbled to see references to prior WRTL free speech cases used as the basis for this new decision. We are indebted to the Jim Bopp law firm for the heavy lifting on the legal issues on our behalf. Wisconsin Right to Life has clearly established itself as a national leader in the annals of history as a fierce protector of our most basic First Amendment right to freely associate and speak on behalf of those we defend. Imagine stepping into a room that looks as big as a football field. Your eyes strain as you scan from one end to the other. Your ears pick up the buzz around the room from a sea of people – 1,500 strong – enjoying each other’s company and eagerly anticipating the main event which is the phenomenon known nationally as Dr. Ben Carson. 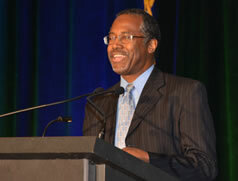 On May 1, Dr. Carson was the keynote speaker at the annual Wisconsin Right to Life Education Fund dinner/gala held at the Wisconsin Center in Milwaukee. It was a no-brainer decision to ask him to headline our event, borne out by the tremendous outpouring of support. Dr. Carson did not disappoint. In his gracious, easy manner, Carson recounted the story of his childhood as a “disadvantaged” child, growing up without a father. His mother’s influence was monumental, for she simply wouldn’t let her children fail. Throughout his career as a famous pediatric neurosurgeon, Carson operated on 15,000 patients, had a movie made about his life and received many prestigious honors. There is even a school named after him in Milwaukee. From a pro-life standpoint, Carson is rock solid. He recounted the time when a woman pregnant with twins was told to abort the one who had hydrocephalus because both of the children could otherwise die. In utero surgery was not common, but Carson did his research and operated on the affected baby. Carson was heavily criticized for performing “unethical” surgery, but presented his data which included the fact that both children survived. Suddenly, he was a hero! Also present at the event were Archbishop Jerome Listecki, Governor Scott Walker and Lt. Governor Rebecca Kleefisch who all added their words of support and inspiration to a glorious evening. This event, which raises substantial funding for the education programs of Wisconsin Right to Life, was a huge success by any measurement. Our guests will not soon forget the massive, inspirational night which introduced them up close and personal to one of the nation’s most sought-after speakers and presented them with an opportunity to invest in saving human lives. “The technique works by removing the nucleus from an unfertilized egg and replacing it with the nucleus of a skin cell. An electric shock causes the cells to divide until they form a ‘blastocyst,’ a small ball of a few hundred cells,” the Post article continues. The research took place using skins cells from two men, aged 35 and 75 and again raises the debate on the ethics of such experiments. While envisioned to help individuals with diseases, the process would necessitate the destruction of the living embryo. And, the cloning process involves the extraction of eggs with complications for the women from whom they are extracted. Finally, the cost is prohibitive which would make it available only to the wealthy at this time. Let’s go back in time to the enactment of the Affordable Care Act, now known as ObamaCare, in 2010. At the eleventh hour when passage was in doubt due to concern that abortion coverage would be included, President Obama signed a phony Executive Order stating that ObamaCare would not provide abortion coverage. The brave pro-life Democrats who were holding out for an amendment to the Act which would ensure that abortion would not be covered “bought” the phony Executive Order, which has no statutory authority, and caved at the last minute. It is clear at this point that President Obama had no intention of denying abortion coverage under his signature Act, and does not care that taxpayers are forced to underwrite the coverage. Fast forward to enforcement of ObamaCare. The National Right to Life Committee (NRLC) released a comprehensive evaluation of ObamaCare which reveals that a staggering $5 billion in premium subsidies under the Act will permit coverage for elective abortions. And counting, as the premium subsidies will dramatically increase in the future. Here’s the rub for those of us in Wisconsin. ObamaCare allows individual states to opt-out of abortion coverage in the health care exchanges as Wisconsin did through passage of a law. Wisconsin taxpayers will not provide abortion coverage for plans covering Wisconsin residents. But the complicated nature of the law forces us to pay for abortion coverage in the 26 states which did not pass opt-out laws. Under decades of federal policy, taxpayers did not pay for abortions under the Hyde Amendment, the Federal Employees Health Benefits program and other federal programs. No longer is the taxpayer protected from tax-subsidized abortion coverage, thanks to ObamaCare. On March 27, a three-judge panel on the 5th Circuit Court of Appeals unanimously upheld a Texas law which requires an abortionist to have admitting privileges at a local hospital. A similar law was enacted by the Wisconsin legislature in 2013 and is currently not in effect due the law being enjoined by a district judge in Madison. A trial to determine the constitutionality of the Wisconsin law will take place on May 27. The 5th Circuit decision matters because the admitting privileges provision is essential to protect a woman’s health. With no admitting privileges, a woman suffering complications from her abortion is placed in an ambulance and taken to a hospital where no one knows her, her medical records are not available, and she is left to explain why she is there. The Court recognized that the law is not a burden to women’s health, as argued by the challengers, but enhances her ability to receive excellent medical care when a complication arises. The decision also matters because it will be difficult for the district court judge in Madison to dismiss a unanimous decision by a higher court. It couldn’t have come at a better time. The headline is beyond imagining, yet the story is oh so real. Channel 4 Dispatches in the UK reports that ten hospitals confessed to burning the corpses of aborted babies with other hospital rubbish. I find it difficult to add more to this horrendous story and will allow the despicable facts to speak for themselves. Hillary Clinton is the clear Democratic frontrunner for President in 2016. The nomination is hers for the taking and she has all but announced. In 2016, we will have completed eight years of President Obama, the most pro-abortion president we could ever imagine. Will Clinton be an improvement? Recent statements make one shudder, for she continues to equate abortion with gender equality. This view is only possible if you have complete denial of the child in the womb. For, if gender equality is of prime importance for women, where is the equality for the female baby in the womb? And how disturbing is it to hold that for a woman to be “equal,” she must have the ability to kill her own child? The New Hampshire House defeated HB 1325, a measure to legalize doctor-prescribed suicide, by a 219-66 vote. A broad coalition of groups coalesced to oppose the measure and was successful in educating legislators on the dangers of this measure. A fantastic victory! Legislation is being reintroduced to legalize doctor-prescribed suicide. HB 5326 was introduced to legalize doctor-prescribed suicide and a public hearing on the measure will be held on Monday, March 17. Legislation to legalize doctor-prescribed suicide recently had a public hearing. Massachusetts voters rejected legalization by voting against a referendum question in November of 2012. Montanans Against Assisted Suicide recently lost its case against the Montana Medical Examiner Board and has appealed to the Montana Supreme Court. A State Senator is drafting legislation to legalize doctor-prescribed suicide. A coalition is being formed to oppose the measure. A bill to legalize doctor-prescribed suicide, A 2270, was recently introduced. This bill adds a new provision which allows other individuals to assist a person’s suicide. An example would be someone actually giving the lethal drugs to a person who doesn’t have the physical ability to take them. A broad coalition is organized in opposition and Governor Christie has publicly stated that he opposes the legislation. A New Mexico judge recently ruled that doctor-prescribed suicide is legal in that state, a move that triggered a wave of dissent. The New Mexico Attorney General is appealing the decision. Vermont became the third state to legalize doctor-prescribed suicide by enactment of a law last year. The coalition which opposed the law continues its activity, most recently calling for the Governor to place a moratorium on the law based on its lack of protections for pharmacists and other healthcare professionals. A federal committee held two days of hearings this week on a procedure called mitochondrial transfer which is accomplished by mixing the genes of two women with the goal of increasing the birth of healthy babies. Sounds humane, right? But, in attempting to increase healthy births, this procedure raises the specter of human gene manipulation which could be used to create “designer” babies. No vote was taken by the panel. Read the Weintraub article here. Euthanasia is a culture of death which knows no boundaries. Once begun, it spreads like cancer to include additional diseases, conditions and even age groups. 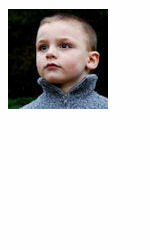 The latest domino to fall is action in Belgium to legalize euthanasia for children. Yes — for children. In December, the Belgian Senate voted for legalization by a 50-17 vote and the Chamber of Representatives followed suit last week by an overwhelming vote of 88-44 with 12 abstentions to approve. King Philippe, Belgium’s constitutional head of state, is expected to sign the legislation into law. What could possibly have motivated this action? Proponents “sold” their most effective arguments. Children must be given this “right” because to deny it is to discriminate. Only a small number of children will be affected. It’s already happening anyway, so let’s legalize it. “The child must have a terminal and incurable illness, with death expected to occur ‘within a brief period.’ The child must also be experiencing ‘constant and unbearable physical suffering.’ Like for adults desiring euthanasia, that diagnosis and prognosis must be agreed upon by the treating physician and an outsider brought in to give a second opinion. As has happened in other countries, these “safeguards” are easily circumvented and will eventually be eliminated altogether as unnecessary. The result of this tragic action will be a dramatic increase in the number of euthanasia deaths.